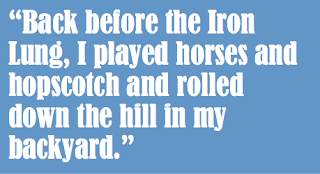 Susan tells her story of surviving polio in Sharon Frame Gay's flash fiction. Sometimes if you're lucky and everything falls into place, magic happens. For me, it is the nights when the stars are so bright they shimmer through the windows. If I am placed just so, I see them echoed in the mirror above my eyes. How hopeful they look, like flinty chips piercing the night sky, dancing so far away, such endless possibilities. I peer up into the silvery length of mirror and smile. Stars are meant to be looked up to, our faces pointing towards the vast universe. So many times, I see the world upside down, but the stars remain where they are supposed to be. People come to talk, and I stare into their nostrils, the bags below their eyes, the jiggle of fat beneath their chins as they waggle with words. Some days I make a game of it. I'll look straight up into their faces, trying to visualize how they really look. Then, I'll turn my head sideways and see them when they take a step or two away, and gauge how close my guess was. Were they handsome? Fetching? Better upside down? I'm content, warm and dry for the most part. Once in a while, my diaper seeps through before the caregiver Molly helps me when morning comes. She is filled with apology then, her large brown eyes distressed as she looks down on me. I smile back up at her. What does it matter, in this vast universe, if I get wet? How does this small thing factor into a lifetime of sorrow, pain, and yet such grace. I have a television in my room, though I seldom watch it. I listen to the music of Mozart and Bach rather than hear canned laughter all hours of the day. I prefer nothing canned. Because this is what I live in. A can. A big silver bullet of a machine that has kept me alive now for over 60 years. The rest of the world has passed by. Effortlessly, it seems. When I crane my neck and peer out the window, I see people scurry along, their legs and arms swinging with each stride, heads bent and thrust forward as though a great wind were blocking them. Children skip. How fondly I remember skipping! For just one moment when skipping, you are weightless, flying, before touching down with a sneaker, or a scuffed brown shoe. To skip is to moonwalk in heaven. Polio is such a strange word. Sounds like polo, but doesn't involve horses, mallets or balls skimming the surface of a field. Nowadays it is merely an annoyance, children grimacing when they get a vaccination. A little pinch that comes and goes, rewarded with a lollipop. Oh, to have been able to get a small shot and escape this armored castle that holds me hostage in its grip! Before polio chased me down and tackled me, I was an ordinary little girl. Susan. That's the name I answer to, although inside myself I have many names, such as Princess Light, Audrey and Daisy. Names I make up when I play stories in my head, which I do all the time. Back before the Iron Lung, I played horses and hopscotch and rolled down the hill in my backyard. I climbed trees and swam, and even rode a pony a time or two. Then polio skulked into town, a dark cloud hovering over the country's best and brightest. The children. It dared to ride on the breeze and infect us with droplets from its open maw, capturing us in the dawn of youth. It carried us out of our homes in baskets, or hobbling in braces, or for a few chosen by fate, placed us in the great Iron Lungs that dotted the world like huge silver bugs, swallowing up children and never digesting us. Like Rapunzel, we were kept prisoner, waiting in near sleep to be rescued by our Prince, or the Grim Reaper himself. At first I was frantic. I was only nine years old, so ill I could not take a breath, snatched away from my family as though somehow this was my fault. The hospital ward was littered with sick children, staring at each other wide eyed. We cowered under the covers, crying for our mothers, our fathers. There were many of us in the big city hospital. Children who were laughing and jumping rope one day, almost paralyzed the next. A lot of children died. But a great many survived, hobbling past my bed on their way home, legs in braces or arms withered, leaning on their family as the ward door closed behind them. I waited for my turn. My turn to leave that narrow, sterile bed and gulp the autumn air in great breaths. I yearned to walk through my front door, lean down and pat my dog Sandy, and sit on the grass in the backyard, weaving the blades between my fingers, smelling the earth beneath me. But my time never came. I was loaded into a massive Iron Lung, face up. The machine breathed for me, loosening the wheezing in my chest. The incredible pressure lifted, replaced by the clanking and sighing of a mechanical mother, now forcing me back into her womb and holding me tight, defying gravity, protection from my own respiratory system. I was a child, and children find ways to cope. At first, it was almost pleasant once I got over the initial fear. I felt better. Everybody was kind. My parents brought me books and teddy bears, radios and pretty ribbons for my hair. I spent the days playing stories in my head. I was a princess, a horse trainer, a crime solver, or a bride. It took several years to figure out I would be none of those things, particularly a bride. No man would hold me into the night, give me a child, come home from work weary and leave his briefcase by the door. There would be no dances, or football games, nor awkward fumbling in the back seat of an old sedan. There was only the rustling and the sighing of the great Iron Lung, as it folded me into its metal breast, suckling me with air. As the decades wore on, I could leave the confines of my carapace each day, poking my head, then my entire body, out of the machine like a turtle, craning my neck and staring about. I was placed in a wheelchair and pushed around the hospital, then later, my home. The air swirled around me as I joined the world for an hour or two, legs dangling like a puppet as we swept down the hallways. Physical therapists worked with me for years. Once or twice they put braces on me, and I stood and walked a few paces. It felt so odd to be upright, as though a leaf had fallen off a tree, then tipped on to its points like a ballerina and danced across the forest floor. Although I was encouraged by family and doctors to emerge from the machine more often, I felt awkward and vulnerable outside its shell. Breathing wasn't as comfortable as it was in the Iron Lung. I had to struggle more for breath, and it was frightening. I hid the anxiety though, as I didn't want to appear foolish. When placed back in my machine, I felt immense relief and something akin to freedom. How odd that the very thing that holds me hostage grants the only comfort I have ever felt. I long for a man's touch, or the ability to run across a meadow. In my dreams, I do. I wake up aroused and frustrated, ripe with excitement. Then I hear the regular, steady breath that comes from my machine, and know it was only a dream, as I pound at the metal in anguish, tears running into my hair. "How do you cope?" so many ask. "How can I not?" I answer back. For this is all I remember now. Life reached into her magic bag and granted me this. It was the coin I was given to spend. I cannot resent nor feel left out. It simply is. I leave no footprints on this earth, but my breath mingles and tangles with all living things. I am just as important, and just as inconsequential, as everybody else. Sometimes, when I am lucky, and placed just so, the stars reach out from the mirror above and invite me to join them. I dream that someday, when I have spent all the breaths God has given, that this machine, my Mother Ship, shifts into a rocket, shattering reality and the window panes, as we aim for the moon. We break through the barrier of the atmosphere, into a universe where breath does not matter, where I can dance among the constellations and see the stars, face to face. Beautifully written and heart-rending, but somehow uplifting as well. A powerful piece. So many stunning descriptions here - the stars "like flinty chips piercing the night sky"....the leaf like a ballerina - just two that captivated me. Beautiful language. So rich in feelings, sad but hopeful. What a great story, Sharon! Thank you all for your kind words. Whenever I feel down, I try to remind myself of those who, day after day, fight the good fight with disability. Health is a gift. I was stimulated by the paradox of that which might imprison us also being seen as an indispensable and only form of comfort. The word 'hostage' is used, and it's a recognized phenomenon that those who are taken hostage become dependent on their jailer to the extent that often they fear the moment of release more than their 'state of imprisonment'. Excellent, engaging read. You demonstrate how even those with the most monotonous existences still have thoughts and memories that are worth hearing. As did modestgodess, I loved the poetic simile: "It felt so odd to be upright, as though a leaf had fallen off a tree, then tipped on to its points like a ballerina and danced across the forest floor." Thank you for taking the time to read my story. I am thrilled with your lovely comments!